I’m so so SO excited to be doing a collab discussion today over the amazingly geeky story of Eliza And Her Monsters! I have kidnapped Mish @ Chasing Faerytales (and I suggest you go follow her blog and twitter immediately because she is #FABULOUS) and we’re going to basically discuss, fangirl, and flail over this tome. We’ve set up the discussion in internet-chat-style in honour of all the glorious internet appreciation in Eliza And Her Monsters! Our “usernames” are also book references. Because we’re nerds. It’s been like forever since I’ve done a collab so thank you x 100000 to Mish for coming over! 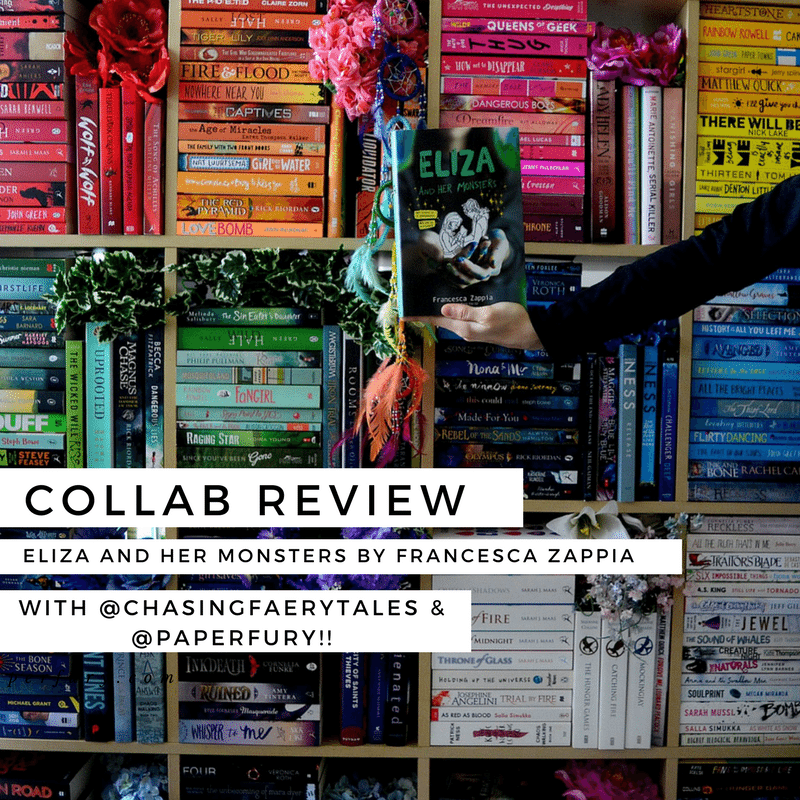 _FaeriesandMonsters_: I adored Francesca Zappia’s debut Made You Up – which is hands down one of my fav books ever – so I was so excited for Eliza and her Monsters. I was very much pleased to see that Eliza had similar vibes, yet was it’s own story. I adored this book, and now I can’t wait to read more of Zappia’s books! Did you feel that the book was similar to Made You Up? _FaeriesandMonsters_: Haha, that’s understandable! Made You Up was just so amazing! But I loved Eliza too, I guess the two stories are two leagues of their own. Like you said, the subject matter was so different, yet there was this similar vibe and I could totally imagine the main characters of the two books conversing in real life. They’re all precious cinnamon rolls for sure! ~constellation_fury~ : Cinnamon is RIGHT. I think one of the biggest things I love about Zappia’s books is how relatable the characters are. Like Eliza is basically the best representation of all we fangirling, internet-loving, geeks! Every time her parents told her to get off the internet and go outside, she groaned. And I was just like: hEY IT’S ME. _FaeriesandMonsters_: OMG YES! Eliza was basically 14 year old me, and the similarity was so uncanny, I was shook! I loved how the book showed a different side of online personalities. The want for anonymity, the ability to live as this whole new person on the internet, and the constant struggle to not get too engrossed in our online lives that we ignore the real world around us, especially as a teen, was portrayed so perfectly! _FaeriesandMonsters_: And her family was just so authentic! Her parents struggling to understand, while being proud, still being worried, her brothers were just the best!!!! I loved their involvement in the book, and the regret Eliza felt regarding how detached she is to her family, especially her brothers, made me almost guilty myself for giving so much prominence to my online life at times without spending family time! ~constellation_fury~ : I sooo agree. I also liked how it talked about the great parts of being really involved with an online life — but it also talked about the darker sides. I never felt preached at though! I loved the balance. And Eliza’s family was A+ for sure! I wish more YA books had healthy and nice families like this! _FaeriesandMonsters_: Haha, I know how much you adore families in YA! It was refreshing for sure! And I agree about the balance as well! 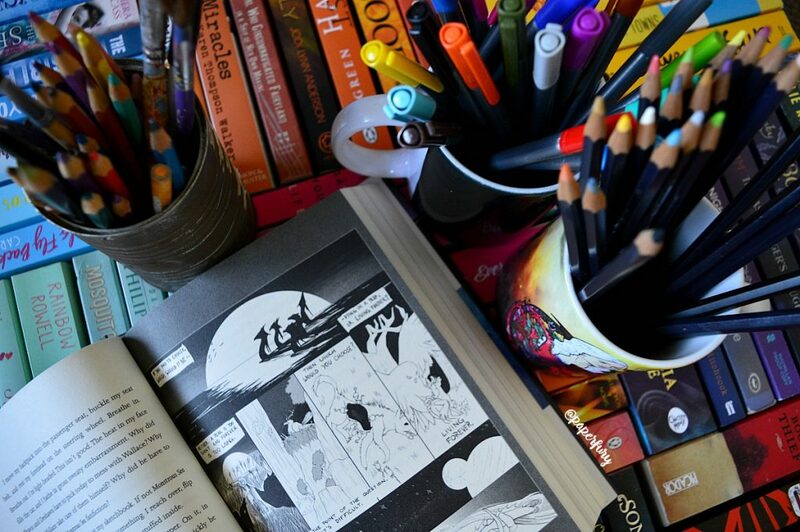 Certain things, like how we form a community around the world, how passion for something brings people together – anyone part of a fandom or has a significant online presence would definitely relate! _FaeriesandMonsters_: And the characters themselves were wonderful! I love how adorably awkward the MCs are, and Eliza and Wallace are just precious. And I also loved how their mental health rep was handled! ~constellation_fury~ : YES. So much awkward. And no instalove too, which is super refreshing. I looove seeing characters become friends first and then reading it developing into shippable squishy feelings. Also they were really quite similar, both struggling with anxiety and depression, but in different ways! I think it was great to show how mental health can be such a spectrum. _FaeriesandMonsters_: So true! I can give a certificate for the book’s rep, as a teen who has severe anxiety and has gone through depression, it was so authentic and real and sometimes so perfectly captured, it made me sob. Eliza’s depression – which is basically the monsters in the book symbolic of, which I LOVED!!! – was so real and I loved how art was her relief but still it was not foolproof or a complete escape, which again was so realistic. And both hers and Wallace’ anxiety was well dealt, and like you said, shown in different lights. I related to Eliza’s anxiety more, and I had to actually put down the book at a scene where she has a panic attack because it was too much to handle. _FaeriesandMonsters_: The book was also definitely much darker than I expected. But it gave the book an intensity which I adored. ~constellation_fury~ : So so much intensity. Which gave it good pacing too…because I was always a bit nervous to see how everything would go (especially when everything was going sO nicely with Eliza and Wallace’s friendship/romance). EXCUSE ME WHILE I STRESS FOR THE CINNAMON CHILDREN. I also loved how they communicated a lot in writing. Which I think is something a lot of internet-creatures like us can relate to? Sometimes it’s easier to write out difficult things than to say them. _FaeriesandMonsters_: I agree! The romance was so adorable and so much like a growing attraction between two awkward kids. I just loved how everything was awkward, period! Also yes for the writing communication! I talk a LOT, but I still feel much more comfortable writing down things, especially when it involves feelings. ~constellation_fury~ : One of my favourite things has to be, I admit, how many illustrations and art was included! (This author is wildly talented!!) I think it totally made the book stand apart from others, even if it had a slightly predictable storyline. _FaeriesandMonsters_: YES! I totally didn’t know about the art, and it was just a pleasant surprise! The illustrations of the webcomic were stunning, and I think a special mention goes to the web comic itself! There were frequent snippets of illustrations and transcriptions, and I so badly wanted to read Monstrous Sea as full fledged novel or comic! It was so good and intriguing!!! _FaeriesandMonsters_: Actually I loved the unique format throughout the book! There were forum chats, forum profiles of the MCs and their updates, and I am always a huge fan of format differentiation in books, and I adored it! ~constellation_fury~ : The unique formatting won me over SO fast!! And also made me super long for the actual Monstrous Sea comic too. (Kind of like Fangirl by Rainbow Rowell turned into Carry On!) And the emails and message chats were some of my favourites because of the banter. It’s epic how complex and alive all the characters felt, even the ones we only “met” over a few lines of internet chats! _FaeriesandMonsters_: Yes! Emmy and Max, had so little screen time, and we literally only know them from snippets of chats, yet I adored them, and same goes to most of the side characters! ~constellation_fury~ : Just reason #9837 why Francesca Zappia is an AMAZING writer. _FaeriesandMonsters_: That she is! She’s definitely an auto-buy author from now on. I can’t wait to see what else she might write in the future! _FaeriesandMonsters_: All the pros aside, anything you didn’t like about the book? ~constellation_fury~ : Literally my only complaint is that I’ve read a few other books like it (notably Geekerella and Radio Silence) so it was a bit predictable to me. How about you? _FaeriesandMonsters_: I have to agree on the predictable aspect! But that’s one of the reasons why the story is so special I guess, plotwise it was pretty normal, but the characters, and the writing and themes made it a spectacular tale! ~constellation_fury~ : Sneaky book…being too relatably awesome that we’re hopelessly destined to do nothing but LOVE IT. I’d definitely give it 4.5 too! _FaeriesandMonsters_: I am so glad we got to read the book together! Okay so collab posts are AWESOME and I need to do more of them. Do I hear a yes from you fiends of the darkness??! Let me know! 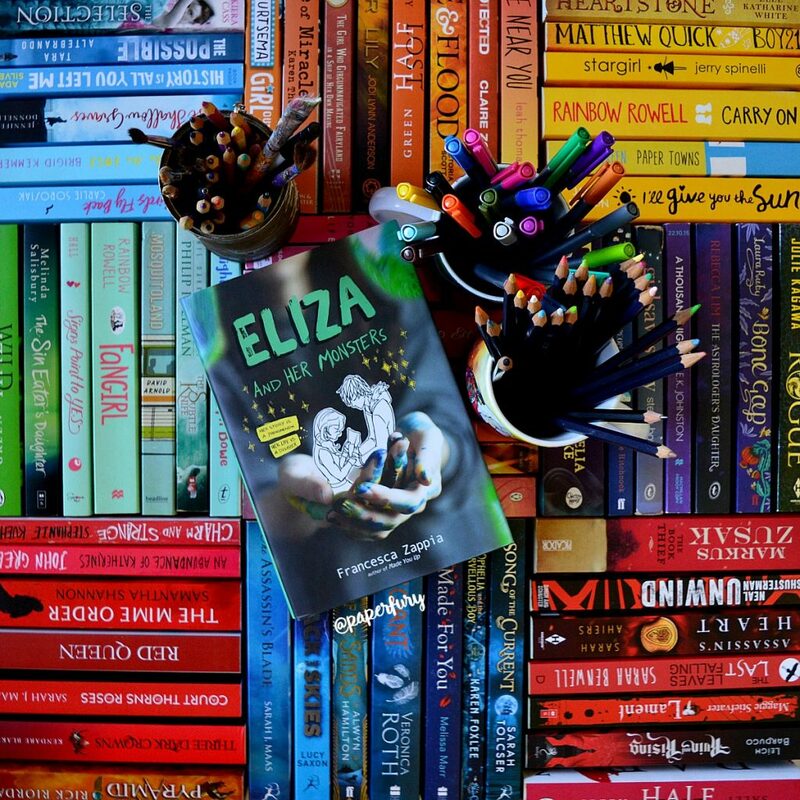 have you read Eliza And Her Monsters?!? are you planning to? do you like books with illustrations? and do you have a secret, or just different, identity online? do you think internet-friends are as important as in-the-flesh-friends?? can you live with just one, or do you need both? LET’S CHAT!! Previous Post: « What Should The Perfect YA Epic Fantasy Look Like? I’m so glad you liked it, Hana!! We did the chat through google docs! 😀 It was super fun! I read this last month, and really enjoyed it, similarities to Radio Silence aside. I don’t really participate in fandom that much, not to the extent these characters do but I still loved how that was explored. I do like illustrations! I guess I would say that my identity onlie isn’t all of me, there are still parts of myself that I don’t put out there, but I’m not defferent. I do think that internet friends are important, in a different way to irl friends. I don’t really knwow if I ‘need’ both, that’s kind of hard to say, but bot are valuable to me. And I loved this collab. Now I really want to do a collab with you one day haha. It was sooo similar to Radio Silence, right?!? It was weird.😂 Great minds think alike obviously! But the illustrations just made it stand out SO MUCH aHHH!!! And omg we should definitely figure out a collab to do someday, Shanti! THAT WOULD BE GREAT. OMIGOSH THAT P.S ABOUT ANOTHER COLLAB. I NEED TOMORROW FAST! Was it super nice seeing you do a collab for some reason? YESSS I LOVVVED this collab! I’m actually going to read this book this summer and I AM SO EXCITED. Internet, geekiness, I AM SO IN. I definitely have a wittier and awesome personality online which I think is great! I like how you have your own amount of time to reply to something and you can meet so many different people and opinions. It’s awesome and in so many ways better than real life. Not saying that talking face to face is bad but for bookworms…well. I have SO MANY internet-friends (AHEM YOUU CAIITTT) but like real close ones as well that are even closer than people I have IRL and it’s scary thinking that I’m talking to someone all the way In Texas and being totally calm about it and acting like we are best chums WHEN WE OBVIOUSLY ARE but I never knew the interweb could be so interactive? Though in-the-flesh people are important! I don’t think I’d have the same relationship with my IRL friends over the internet? Haha, I'm the same, tbh.😂 I have like 2 facial expressions IRL...so thank you, emojis for your helpful way of communicating feelings.😂 And the chance to take your time to type out an answer instead of blurting it without thought it so good imo. I love it. INTERNET FRIENDS ARE SO GREAT THOUGH. <3 I mean, I loved doing this collab with Mish and how I'm in Australia and she's in Sri Lanka! I MEAN, HOW COOL IS THE INTERNET. There`s so much hype about this book and I had no idea how much of it was real, but you totally convinced me to get this book. I am a bookworm, I am awkward, this is the book for me. Really?!? I hadn’t seen ANY hype for it or anyone reading it.😂😂 But I’m glad I convinced you!! Stories within stories are always an interesting concept. I hadn’t heard of this story before but for some reason I want to read Monstrous Sea more than I want to read Eliza and her Monsters? Hm. Me: Ah yes thank you hello I just really needed to hear your voice but that’s good I’m okay now. That was the same year I would mope around my dorm until my roommate came back even if we both had work to do (I had no idea I was this needy before?) Also I’m quite lazy in my social life and if I’m not forced to encounter someone it’s possible I’ll forget of their existence. So…yeah. Hahah! I want to read Monstrous Sea SO badly now too!! But Eliza was so relatable <3 the book is just gloriousness! I need to read this. I’m not in any fandoms, but I’m curious about the whole webcomic/fandom thing in the book. Fun post! It worked SO well in the book!! I wanted to read the whole webcomic afterwards though.😂 If oooonly it existed! Ahhh SO glad you liked it, Lissa!! AND THIS BOOK CALLS TO YOU. Emma and Max were SO awesome. <3 Tbh I want to know all about Emmy, that smol engineering genius!! That cover is ADORABLE! And you mentioned illustrations so I’M IN! I’m gonna have to add this one to my TBR! You guys are adorable, and I love this joint review. I pictured you two at a cafe chatting about this book when I was reading this post. I’m so glad you guys love this book, it’s been on my TBR for a while but I may just have to push it to the top now. AWw, that’s the best visual!! (If only!! 😂) It was so so fun to do a collab like this so we’ll definitely have to make it a reoccurring thing. :’) And YES. I hope you do read Eliza and her Monsters soon! IT’S TOO UNDERRATED. Flurg. I love this!! And the chat is so clever I cry 😭 And now I REALLY need to read this booooook!!! So many relatable things I die!! I wanted this book just for the cover. So excited that it has illustrations. I love this! Thanks for sharing and love the collaboration. Oh I LOVE this!! My copy should arrive any day soon. And I didn’t realise it had pictures??? Heck yes. As for my identity online, it’s definitely more…polite than my real self. I blame it on being Australian. I know right?!? I was so surprised at the pictures and it made it 1000 x better.😂 Voting for illustrations in ALL BOOKS. Whyyyyy do you keep adding more books to my TBR?! 😀 I really want to read this now! Personally my non-internet friends are also nerdy bookworms, so I’m lucky there, but I think having internet friends is also important. No 😛 😛 I read SIX of Crows with ONE internet friend 😛 Six people would have been crazy! The biggest buddy read I’ve done had 3 of us in total! AND YES THE DREGS ARE BAE!!!! OMG I’M SO ASHAMED.😂😂I swear I can’t even read. 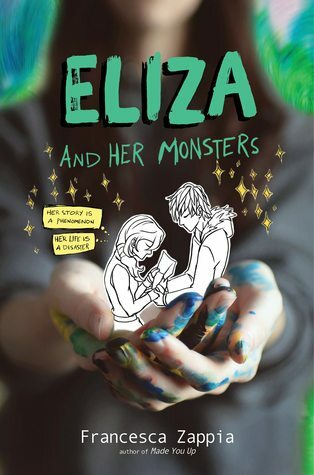 I totally loved Eliza and her monsters… SO RELATABLE.! I still need the read Made you up… Is it good? Or perfect? I really liked the format of this collab. I shall be looking forward to more collabs in the future! AHH THANKS, GRACE! I definitely want to do more of these in the future!! Wouldn’t it be awesome to be actually able to read it as a webcomic though?!? WISHES. Awww, ZOE. YOU’RE SO LOVELY!! <3 And I'm so glad you liked our discussion. Also *whispers* you muuuust read this one!! Oh my god, I love this style of review! You two should definitely do it more often! I’ve wanted to read Eliza and her Monsters since I first heard about it, but I didn’t realise it dealt with mental illness, too! Will need to get my hands on it even more now. Also love that it also includes extracts from the webcomic in it, too, that’s so cool! I don’t mind books with illustrations, as long as it adds to the story. I like to imagine things myself though, so I don’t like anything too illustrated. I’m not really a fan of comics/graphic novels, I must admit. I used to have a different identity online when I was younger. It was Zanthia – the name of a character in a computer game called Kyrandia; she’s a witch, and I thought she was just so cool! And I loved her name. And all my in-the-flesh friends started off as internet friends, so yes, they are absolutely just as important. Due to crap I went through when I was younger, I didn’t really go out much as a teenager, so all my socialising was done online, on fan forums and such. As I got older, I made friends via bands’ forums lot of those friends became my closest friends who I met up with whenever I was able. All of my very best friends started off as someone I would chat to online. I can’t emphasise the importance of those friendships. Without them, I’d have felt so alone (I had my friends from school, and they were cool, but they weren’t exactly “my people” if that makes sense. They didn’t get me as much as my online-turned-real-life friends). Loved the review, ladies! So excited to read this! YAYYYY I’M SO GLAD, JO!! It was so fun to do and just to shake things up a bit. *flails happily* And I had NO idea it had pictures and was all about anxiety too <3 So that was like a double surprise! I should check out that Thornhill! I've also heard of a book and the title is failing me...Afterworlds? By Scott Westerfeld? ANYWAY. I think it's about like the girl in a book and the girl WRITING the book which is cool. And that's really cool you started off anonymous online! I kind of wish I had a screen name sometimes, tbh. But I am sad you had a bad childhood. 🙁 But I'm really glad you found the internet and supportive/great people!! Loved the conversational post between you two. I’m dying to read Eliza and Her Monsters (from the title I picture a tiny child surrounded by friendly beasts protecting her from the world, though the synopsis sounds good too, I guess XD). ~constellation_fury~ is my new favourite thing, though. Totally fun to read! Thank you! I hope you love it if you get a chance to read it!! That’s so great that you have both IRL and online friends!! It’s probably healthy to have both anyway hhhhahah.😂 ahem. Also that is the SWEETEST blogging/friendship story ever!! I haven’t read it yet, but I have a copy and cannot wait to dig in! I’m super excited for the pictures in the book, and loved the format of this review/discussion. I also am in need of more collabs, so if you ever want to do one, let me know!